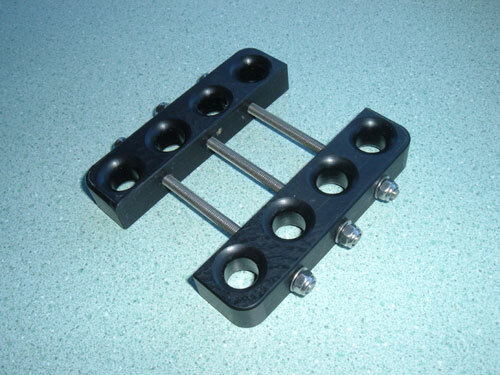 Replace those heavy and expensive centrecase mounted control line turning blocks with these lightweight acetal plastic fittings. Saves weight (approx. 400 grams depending upon fittings used originally) plus save money on 8 turning blocks that costs around $300. 10mm Holes with radiused edges for smooth running control lines. 5mm stainless steel threaded rod with nyloc nuts. Cut to length after fitting. Simply drill three holes (at 15.4mm - 1 inch centres) in the centrecase (making sure they clear the centreboard) and mount the deadeyes.